Mitchell Muehsam, associate vice president for academic affairs and dean of graduate studies at Sam Houston State University, has been named dean of the university’s College of Business Administration, effective Aug. 1. “I am delighted to see Dr. Muehsam receive such a positive endorsement from the search committee and am very pleased with his appointment,” said SHSU Provost and Vice President for Academic Affairs David Payne. “Dr. Muehsam has been an outstanding leader as associate vice president and dean of graduate studies,” he said. 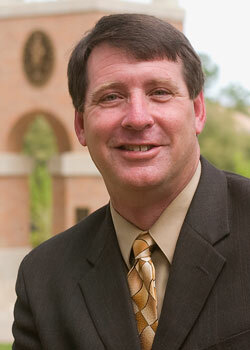 “He will provide superb leadership to the College of Business as it moves forward from its current strong position. Muehsam said that he was looking forward to taking his new role as dean. “I am excited to have the opportunity to work with the faculty, staff, students, alumni and friends of the College of Business Administration,” he said. “Together we will continue to build upon the foundations of excellence that are already in place. It is an honor to follow the footsteps of my mentors, Dr. James Gilmore and Dr. R. Dean Lewis,” he added. Muehsam received his Ph.D. in statistics from Texas A&M University in 1989. He joined the SHSU faculty that year in the Department of Economics and Business Analysis. He was promoted to associate professor in 1995 and to full professor in 2001. In addition to his teaching responsibilities, Muehsam served as associate dean and coordinator of graduate studies for the College of Business Administration from 1995 to 2003, at which time he assumed his current position in Academic Affairs. He has been a member of the executive committee of the Conference of Southern Graduate Schools; president of the Association of Texas Graduate Schools; and currently serves as vice chair of the Texas Higher Education Coordinating Board’s Graduate Education Advisory Committee. He has authored a number of journal articles, papers and book chapters and has made presentations at national and international professional meetings, conferences, seminars and workshops. Throughout his career at SHSU, he has either chaired or been a member of numerous university committees and has been a faculty adviser for several student organizations. He has also served as a tourism industry consultant in the United States, as well as abroad.